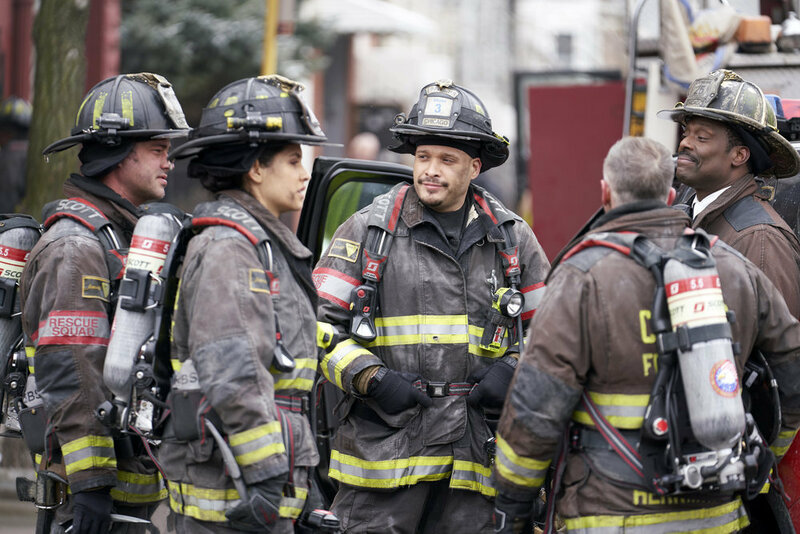 Chicago Fire season 7 episode 17 was a flicker of hope — not just for characters and their futures, but also the city of Chicago. It’s a reminder that one person on the ground, doing the right thing can really be enough to change lives dramatically. With this in mind, let’s spend a minute now putting some of the focus on none other than Stella Kidd. She was the hero of this story more than anyone, as she discovered in the early going of the episode a secret compartment that could be used to store away children. It was a horrifying thought, but not one she was willing to just shove away in the recesses of her mind. She investigated in the best way that she thought she could — with the help of Hailey Upton, and then also with the support of Severide at her side. Even when the trail ran cold and there was nothing that Upton and PD could really do in order to help her anymore, she still found a way to keep her mission going. Because of Stella’s efforts, she was actually able to find the guy who was taking advantage of the foster-care system and in the aftermath of that, was receiving improper benefits and pocketing them for himself. She saved two young kids’ lives, and this has to be the main takeaway from all of this. We won’t forget it, and we certainly don’t imagine that Kelly is going to, either. Maybe this is perhaps the ignition in furthering along the storyline between Stella and Severide as the two start to find a way to grow closer once more. Severide had everything; he ruined so much of it, but we don’t think that the possibility of the two having a future together is completely in ruins. There is still a way that it could be rebuilt, but it’s just going to take some time and continuous effort. It’s acknowledging the mistakes, but then also trying to find a way to work moving forward to get better. At least coming out of this episode, the skies are a little clearer for Severide … but there are certainly a few clouds that cannot be forgotten. Aside from Severide and Stella’s storyline the prime storyline tonight revolved around none other that Christopher Herrmann realizing that there were a wide array of ways to shove his foot in his mouth. First, we saw this with Casey following an incident out the field — he didn’t take the negative feedback well and more than that, he felt like Casey infringed on his Lieutenant territory by getting a new floater onto the truck, someone who Herrmann didn’t even want as a part of the team. The two had it out but eventually, it was Herrmann who realized that he was in the wrong, and had to put in that extra effort to make things right. Of course, right when he started to pull that foot out, he shoved it right back in with his wife as she tried to redesign the firehouse for a photoshoot. Because he failed to properly listen to her, he didn’t realize that the photoshoot design was just a temporary setup; she wasn’t really trying to get rid of the couches, the chairs, or really anything else; it was just a one-time thing but because he didn’t realize it, he flipped out when he saw all of the changes that she made to the house. He’ll find a way to make it right, but the one question we’re really wondering in retrospect is this: If his wife knew that this photoshoot was just a one-day thing, why didn’t she say anything to any of the other firefighters when she was at the house beforehand? Unless everyone collectively ignored her (not a great look, if true), it seems like a gaffe on the part of everyone to magically gloss over this. None of this takes away from the fact that we’ll take David Eigenberg getting a ton of screen time in anything. He’s one of the most relatable characters in the house mostly because he’s real, he’s messy at times, and wants nothing more than to do an honest day’s work and do it well. Chicago Fire season 7 episode 17 brought a tremendous reminder of how fire a good firefighter will go — but with Stella, it wasn’t about her just being a good firefighter. It was about her being a good person and doing whatever she can to help some kids without provocation, and really just based on a hunch. She followed that hunch like it was a laid-out treasure map and because of it, two kids are a little bit safer. In the long-term, this is the story Kelly needed — it’s a reminder of what he’s missing and beyond just that, an indicator that those feelings, and that initiative, could be on its way back. Be sure to visit the link here to check out the latest preview we’ve got on the subject of the show!